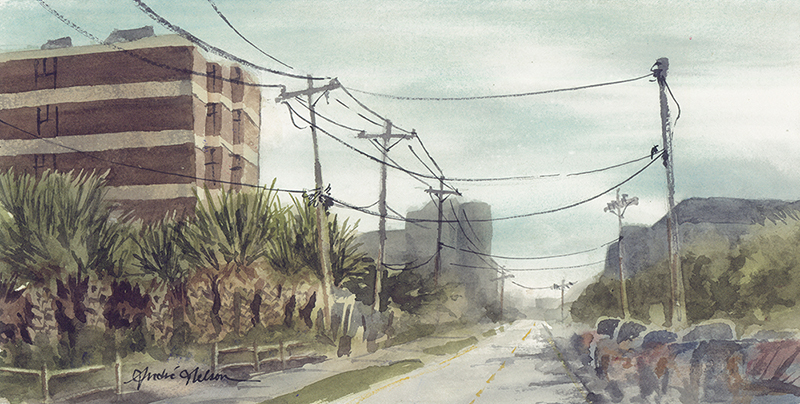 The essence and feel of North Myrtle Beach is, in my opinion, captured quite well by this painting. Ocean Boulevard extending as far as the eye can see down the coast, the mix of normal houses on the inland side of the street and towering resorts on the other, and the abundance of telephone poles stretching in every direction all characterize the visual character of the area. The title can be explained by the fact that the whole coastal area from Little River to Georgetown, SC (including Myrtle Beach) is referred to as The Grand Strand, or The Strand.